And yet, while A Kiss Before Dying, by the late Ira Levin, has all the signature style and undeniable glamour of a somewhat noirish American thriller, not to mention a characteristically sensationalist plot, there's plenty to set it apart. The story begins with an unnamed young man plotting the death of his fiancée, Dorothy Kingship - a pretty, rich, naive college student. Having planned to marry her to get his hands on some of her father's money, he's furious to learn that she's pregnant. This being somewhere around 1950, this seems likely to force them to marry immediately and incur the wrath of Dorothy's father, who will almost certainly disinherit her as a result, leaving the nameless protagonist poorer than ever and saddled with a wife and child he never wanted as well as ruining his master-plan. Consequently, when pills from a backstreet abortionist fail to work their magic, the only alternative, he feels, is murder. But then, Levin pulls a particularly clever trick. He switches the novel's point of view. Suddenly, we're in the position of Ellen Kingship, trying to discover who has wronged her younger sister. All she knows is that she has to look for a handsome, charming blond college boy in his mid-20s (his academic career having been interrupted by World War II, of course). There are a number of contenders. And it could be any of them. Terrifyingly, any of these affable, bright, all-American boys Ellen meets could have the mind of a psychopathic killer - a mind into which we, as readers, already have a horrific insight. 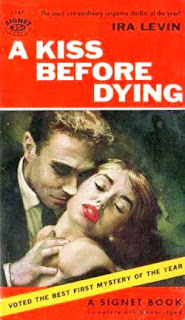 Those familiar with Ira Levin's best-known works - Rosemary's Baby, The Boys From Brazil, The Stepford Wives, all of which became immensely successful films - will know that his books tend to stretch plausibility a little, and yes, A Kiss Before Dying does this too. But somehow, it's all so neatly plotted in every detail, with every character so absolutely spot-on for the roles they have to play in the story, that I found myself believing every word. It may be pulp-influenced at times, and at times it's a wee bit overblown, but the writing is so sharp that it simply doesn't matter, and Levin has been astute in building his characters convincingly to give them credible motivation. 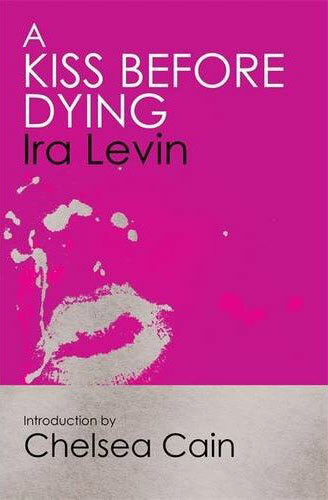 As in his other books that I mentioned, Levin uses A Kiss Before Dying to tug at a sinister, dysfunctional thread that unravels the fragile tapestry of a classic American setting to reveal a dark, calculating cruelty lying beneath. Nobody and nothing are what they seem in Levin's novels, and reading this book is like stepping into the world of a stylish Hitchcock film full of beautiful women, fabulous outfits, ever-building tension, surprise plot twists and ambiguously charming men who may or may not be calculating killers. Sounds like an interesting read, I like that 1950s noir period. It's very much of its time - but in a really good way, and it's definitely a page-turner. Sounds terrific! Thanks for the brilliant review. Glad you like the review. And don't worry, you're not showing as anonymous!